Voting for the official onematchstick T-shirt ended yesterday. 10 designs were submitted, and by golly - each one was unique and brilliant! I want to write more about each of the designs over the next week or two, but for now, a big THANK YOU to all the designers who took part and came up with such creative and wonderful designs. Thank you!! The top 2 designs were so close to each other, so very close! It is with great delight that I announce that the winner is Tu's design entitled Mission: NOT Impossible. So, so close behind this design was Caric's design called Fire works. Today is also the day I've coined "T-shirt Trade Day" and it marks the final stages to my tenth trade. I've received 116 pledges from people saying they will trade with me for one of the 375 springleap.com T-shirts. So I'm looking now for 259 more people to trade with. 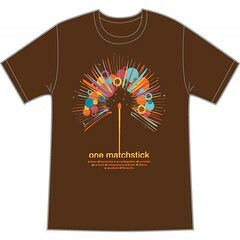 The official onematchstick T-shirt is now available as one of the T-shirts to choose from to trade with me. This T-shirt is about to go into production, so if you choose to trade with me for the official onematchstick T-shirt, delivery will take a few weeks. But don't let that stop you- it's an AWESOME T-shirt. And there will be a very limited number made, so this is your only chance to own one. There is also going to be a limited time that this T-shirt will be available too- so you better move fast if you want one. Ha! Would it have been anything else? Remember though, that the code is case sensitive- so make sure you use all small letters and one word. Again, Well done to Tu! 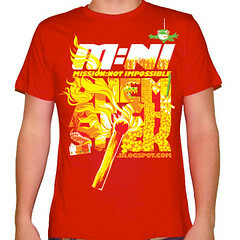 Check out the official onematchstick T-shirt here. Very happy to have been part of this! I'm so stoked to have designed your official tee and contribute towards your big dream!! Hi Telana, just made my trade for 2 shirts!